Laura has been a member of the AMR team since 2003. 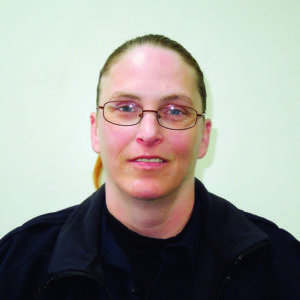 She became a Certified First Responder, then an EMT, and served her community as a volunteer at GVEMS/Caledonia Ambulance for six years. During this time, she realized she had found her calling. In 2005, Laura decided it was time to go back to school. In 2006, she attained her Paramedic certification. In her work as a medic on the overnight shift at AMR, Laura has responded to many disturbingly violent scenes. She and her partner were the unfortunate witnesses of a near-homicide, having arrived on a scene prior to law enforcement to respond to a non-specified emergency incident. Laura cared for the first critical patient on this scene after witnessing that patient’s brutal attack by a pitbull. She maintained her professional demeanor and composure, and requested law enforcement to the scene. This is just one of several high-stress incidents that Laura has responded to in the recent past. Additionally, Laura has responded to multiple mass shootings over the past several years. While she manages her own emotions, Laura always works hard to help others cope. Laura is a medic who is always available to support others. She continually works to enhance safety in EMS by sharing her experiences with new providers. Laura is a resilient professional, and as a full-time caregiver in a challenging urban environment, she is certainly a most deserving Star.